You can buy one new or used, you can build one...you may hope, but, this is the most important decision you will face ! You dont have to be a rich man to go voyaging. Some boyhood buddies and I did it in a wooden homemade river skiff for the price of $5. The story of how and why this boat came to be was published in a national magazine called Messing About In Boats. I used to subscribe to about five boating magazines, but this one is the one I cant live without! Filled with info on small boats, and true stories of voyages in them. It is published twice a month, 24 times a year, at slightly over One Dollar an issue $32/year. See links. If you have the money, and if you only plan to take one other person with you, there is a boat called a C-Dory that cant be beat. I did own a small cabin on the upper end of Old Hickory Lake on the Cumberland River, and very little traffic is on this part of the river this time of year (11-5-01). As I was rolling Thompsons water sealer on the deck today, I saw the first C-dory I had ever seen on the Cumberland, and she was a beauty! Looked like blue trim on the boat, which was white, with a green cockpit awning. If this was you, drop me an e-mail...tell me about your voyage, if you allow me to, Ill put it on this site, so others can share...thats what this site is all about!!. This particular boat is also known as the River Horse in a book called River Horse by William Least Heat-Moon, about a Voyage Across America from the Atlantic Ocean to the Pacific. See links for C-dory site. 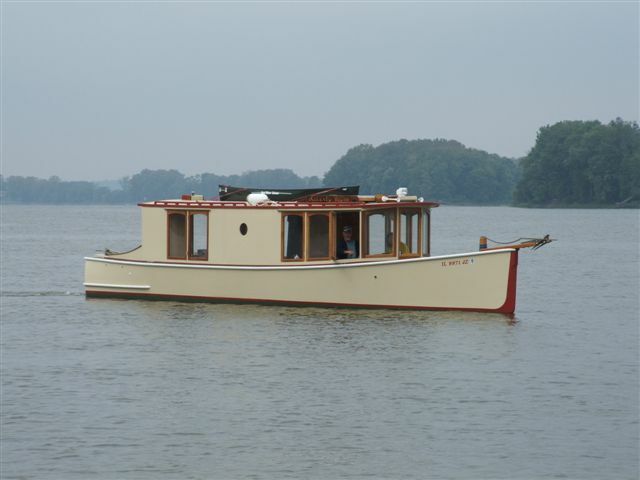 Check out the Mississippi River Boat Design that our member Tim Powell came up with, as well as construction photos, in the Photo Albums section. You may also want to try the Useful Calculations link below! Check out the Photo Log of building the June Marie . Check out Photo Log of Ed Einhorn's building Tennessee . For hundreds of Amateur Boatbuilding and Restoration Projects, go to this link The Mother of All Maritime Links . Already have a boat, but need to modify it for cruising? Check out these two modifications to a MonArk model 1860 jonboat! Photolog for Blue Heron . and Photolog for Riverbird Construction and Voyages . Check out the cost for a design mentioned above: Bill of Materials for Construction of Tennessee design . Check out these sites: Wurlington Brothers Trashboat . The Floating Neutrinos ... very nifty rafts, and a superb site! Check out the Boat Bookcase for Chart Books, Logs, etc. Need a Boat building shed? Check out this Scalable Shed built by a retired guy and his wife. Cruising America - Halcyon Days - Great stories of a C-Dory cruising everywhere! Robb White's Rescue Minor Check out a Revolutionary Boat! The Island Pilot DSe Hybrid and here's another Revolutionary Boat!